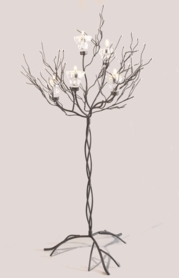 This beautiful dark brown candle tree is perfect for so very many applications! Would be stunning on a mantle or hearth, as a table centerpiece (hang strands of beads or crystals down it too! )...or in that blank spot where you just need SOMETHING fabulous! The 3 candle cups will hold: tea light candles, votive candles, or taper candles! Branches are bendable for perfect positioning. The base is pretty enough to forego draping, and the twisted trunk gives it an extra touch of class. Beautiful and just the right height for a centerpiece. Large enough to be enjoyed, small enough to carry on a conversation with others across the table. 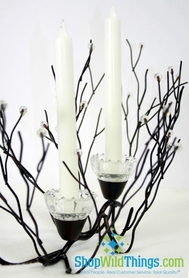 ProsThe lovely glow when adding candles or tealights. the way the tree can fit any decor. 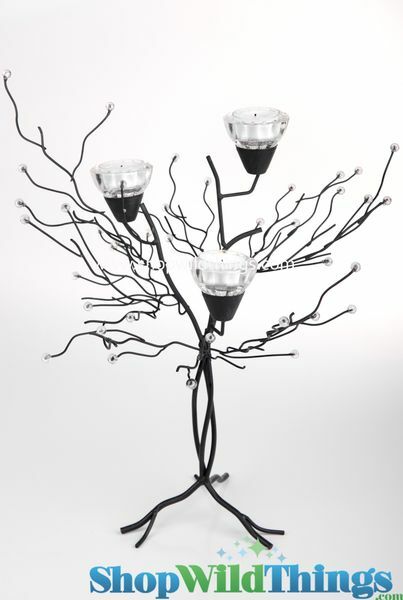 the small crystal beas at end of the branch catch light from candles or tealites. These trees are beautiful. Very elegant for any wedding or party. Love them!